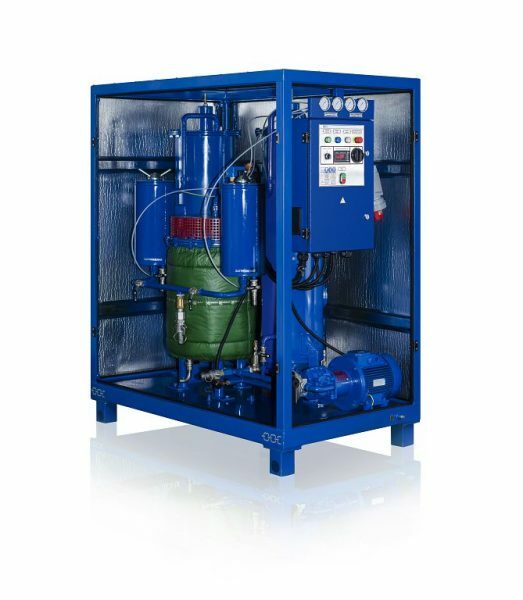 The MCU oil purification unit is designed for removal of solid particles and water from dielectric insulating oils (with a viscosity of no more than 70 cSt at 50°C/122°F. Additionally, this unit is designed to significantly reduce acid levels in used insulating oil. The unit is used for installation, repair and operation of high voltage oil containing equipment with voltage up to 1150 kV (power transformers, high voltage switches etc). The system consists of two separate sections: A BNF heating and filtration section and the CP-260 sorbent cartridges that which are connected by flexible hoses. • explosion and fire safe area.